Check out their website for the entire schedule! If you have older kids they might like this christian alternative to a haunted house. Make your own bracelet and take it home with you for Free! Event intended for ages 6 and up. One per child. We stumbled upon this last week, when we were going to the Lego event and my daughter loved it! We are going back this week, because my son wants one in "cool" colors for himself. Come join us at the Millbrook Village Green on Saturday October 26th from 10am to 12pm for Boo Fest. Bring your trick or treat bag and be sure to wear your not so scary halloween costume! The Shoppes at EastChase Fall Harvest Market is this Saturday, October 26 * 5 - 8 PM and will be located next to Earth Fare! Fresh produce including persimmons, satsumas and more. You will also find mums, crafts, home baked goods and other gift items. Bring the kids for treats, hayrides, inflatables, balloons and stay for the costume contest hosted by BAMA Country starting at 6 PM. Note: Many of the things like the pumpkin patch, hayride and the balloons will have a charge that will be benefiting The Joy To Life Foundation. Free docent led tours every Sunday at 1pm. 3800 Vaughn Rd. Cake walk, bouncy house. No scary Costumes. For Toddlers-2nd Grade. Line up begins at Prattville City Hall at 3:30 pm. Bring a Non-perishable food item for donation. Toddlers-4th graders. Behind the city administration building. 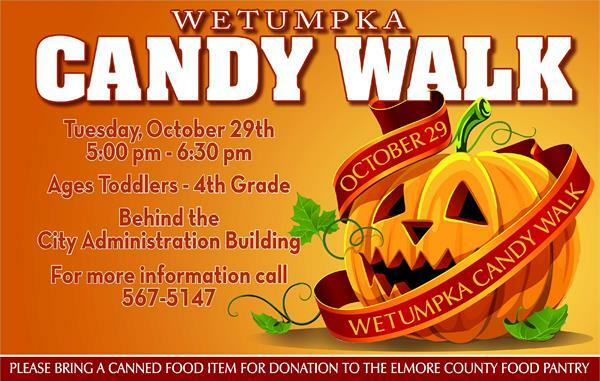 Bring a canned food item for the Elmore Co. Food Pantry. Hotdogs, drinks, popcorn, peanuts, cookies, candy, inflatables, games, Treat Street, hayrides, family pictures. No scary costumes. Free food.